What are the best autism toys for children? Children are so different from one another and so are their needs. Does your child like physical activity? An indoor ball pit or trampoline might help your child with autism expend some energy. What about sensory issues? Many kids benefit from soothing toys such as stress balls and fidgets. Visually-oriented children are often drawn to motion lamps and liquid timers. LEGO blocks and educational puzzles are popular with autistic children. When choosing the best autism toys for the child in your life, it is important to take into consideration not only preferences and interests, but also what is most appropriate for the child’s age, ability level, and developmental stage. Physical activity play toys are wonderful choices for children who have lots of energy or who struggle to find a constructive way to harness energy. Educational toys for autism can support children in meeting their academic goals as well as helping to support their curriculum and therapeutic goals. Tactile toys are a great option for children with sensory processing disorder who have very specific preferences in sensory input and who use toys as a way to self-soothe. Tactile toys may include visual toys or tactile puzzles for children with autism. When finding the best autism toys for toddlers as well as hunting down ideas for the best gifts for kids with autism, it is important to take into consideration his/her individual special needs. Below, you will find ideas for children with autism in each of these scenarios. What are the best autism toys? For a child with autism, physical play can be an excellent way to help improve hand-eye coordination, develop healthy movement habits, and expel anxious or excess energy. Finding an engaging physical toy that is not over-stimulating or overly complicated can seem like a daunting task. The “Give a Flip” toy from Fun and Function offers children with autism a fun way to improve coordination, process timing, motor planning, and visual tracking skills. The game consists of a wooden board with an unstable bottom and a beanbag or ball at the opposite end of the user. The child stomps on one end and catches the beanbag or ball as it flies into the air. You can find a demonstration of the Give a Flip being used as well as pictures and additional product information at https://funandfunction.com/give-a-flip.html. Trampolines, especially indoor trampolines (which can be used in all weather), are another excellent option for children with ASD. For kids who enjoy vestibular motion, need to work on their gross motor skills or balance, a trampoline can be a wonderful toy. Many indoor trampolines are small enough to fit in a living room or bedroom and can be easily folded up and transported for on-the-go use. The Autism Community Store offers two fold-and-go trampolines perfect for young children with ASD. Ball pits have long been recognized for their ability to complement other therapies in a fun and engaging way. The bright colors and interesting sensation of being immersed in the pit tend to appeal to both young children and adolescents. eSpecial Needs notes that “The balls massage the entire body, provide buoyant support, deep-pressure sensation and encourage relaxation. The visual, auditory and tactile sensory stimuli and the proprioceptive feedback build confidence and strengthen sensory motor skills.” (Ball Pits, 2018) Ball pits can be constructed as a do-it-yourself project with a large children’s paddling pool and balls or it one can be purchased premade. eSpecial Needs offers several varieties. Children who have special interests may enjoy autism toys tailored to his/her interests such as trains, dolls, dinosaurs, or books. However, if you are looking for autism toys to support your child’s therapies, specialty websites can be a wonderful resource along with suggestions from your child’s therapist. The National Autism Resources website offers a large selection of toys that are educational and appropriate for children with autism. Tie Me is a great example of an educational toy that can support occupational therapy. Tie Me helps children learn how to tie their shoes with a large wooden shoe shape with laces. Children can practice the skill of tying their shoes on a larger scale and from different angles. The thick laces give little hands something more substantial to grasp. Children can practice tying a variety of knots in addition to tying their shoelaces. 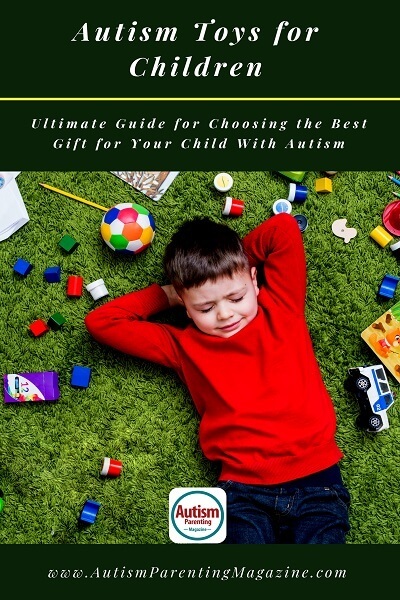 For full product information, you can visit https://www.nationalautismresources.com/tie-me/. LEGO blocks are undoubtedly one of the most popular autism toys among children, both with autism and their neurotypical peers. LEGO® blocks encourage the development of fine motor skills, visual perceptual motor skills, cognitive skills, sensorimotor skills, self-efficacy skills, and help children develop their imagination. If your child enjoys playing with LEGO® blocks, consider having him/her join a LEGO® club offered at a local community center or as part of an afterschool program. If you can’t locate a club, consider starting one in your area. While it’s not considered formal therapy, the social and cognitive benefits are endless. To read more about the impressive benefits of LEGO® blocks, check out Amy Wagenfeld’s article first published in Autism Parenting Magazine, LEGO Therapy: How to Build Connections with Autism – One Brick at a Time. Dollhouses are a wonderful way to help children develop social skills and explore interpersonal relationships and their community through play. Dollhouses allow children who require extra reinforcement to practice routines and activities of daily living (ADL’s) through role play. Engaging in dollhouse play with your child with autism can also be an excellent opportunity to reiterate household expectations as well as give you insight into your child’s understanding of his/her environment. Play Therapy Supply offers a variety of dollhouses and accessories. Many children with autism enjoy the process of mastering puzzles. When you are searching for the best puzzle for your child with autism, it is important to take into consideration his/her interests, current skill level, goal skill level, and how much of a challenge he/she likes. Many children may find great enjoyment from Melissa and Doug floor and jigsaw puzzles. These puzzles cater to a wide array of interests from school buses and sea life to math and letters. Most Melissa and Doug puzzles have large, chunky pieces that are easily manipulated by children still mastering motor skills. The website categorizes puzzles by the skill taught as well as age range, so you are sure to find something appropriate for your child. As early autism diagnosis and intervention have increased over the years, more parents find themselves trying to select the best autism toys for toddlers. If your child’s autism diagnosis is still new to you and you are struggling to find appropriate and fun toys for your child, his/her therapist can be a great resource for finding appropriate autism toys. If your child is showing a special interest in something, such as trains, it can be useful to capitalize on that interest to capture attention. Using a favorite item such as a plush toy to create social stories can be a useful way to reinforce therapies and problem solve with your child. However, creating time for child-led play is just as important in children with autism as it is with their neurotypical peers. Children will often lead you to what interests them. A trip to a toy store may be overwhelming for your toddler, so giving several clear choices may be a more manageable way to learn his/her preferences. Holding pop tubes (tactile toy tubes that create noise) in one hand and a dress-up cape in the other and offering a clear choice to your toddler will help him/her communicate preferences with you. The Wiggly Giggly Ball from National Autism Resources is a large, brightly colored ball that giggles when it is shaken. The brightly colored balls have indentations to make grasping easier and help children refine their gross motor skills. Sensory Rollers, also from National Autism Resources, are similarly shaped balls with different indentations that children can trace, feel, or with which children can create different tracks in the sand. These balls encourage sensory exploration, hand-eye coordination, and the development of fine motor skills. Why use sensory toys for autism? What are the effects of sensory toys for autism? Children who are receiving therapies for SPD are often overwhelmed by the process at times. Introducing sounds, tastes, textures, smells, and sights, that children struggle to process can create anxiety and stress. Using sensory toys that the child is comfortable with as a way to introduce new stimuli as well as a “safe object” during times of stress can be incredibly helpful during therapy. Sensory toys “may help children with autism focus, calm down in stressful situations, or relax. Children with autism are often drawn to visually stimulating toys such as motion lamps, liquid timers, and illuminated bouncy balls. These autism toys, often rhythmic or fluid in nature offer children a way to engage their sense of sight that is not jarring. Visual tracking is important for children developing reading, handwriting, and coordination skills. In addition, visual toys can offer a way to help children self-soothe. This Glittering Vortex Lamp from The Therapy Shoppe is a wonderful option for helping children calm down before transitions, for use during sensory breaks, or before bedtime. It is also helpful for use when your child becomes overstimulated and may be used as a tool to help prevent meltdowns. (Glittering Vortex Lamp, 2018). Liquid timers usually fall into the “fidget toy” category as they are great options for playing with during class, car rides, or times of heightened anxiety. Liquid timers come in a variety of shapes and colors including novelty versions featuring favorite characters. The Therapy Shoppe has a collection of liquid timers available here. Finally, illuminated bouncy balls are a great visual toy option for children who are working towards improving their hand-eye coordination or who enjoy being more active. Illuminated bouncy balls light up when they make contact with a hard surface and can come in a wide range of textures. Some are squishy or spiky, other are smooth or have ridges. The Wavy Mini Light Ball and Color Changing Light Ball are two examples of balls that your child may enjoy. Your magazine is great for those who have children with autism. It would be great to see something for those of us who had children with autism but that are now adults with autism. Where do we go to find the things that work best and help with gift ideas for those individuals? Hello Ben! Thanks for the idea. We’ll inform our editor about it. We currently don’t have specific information you’re looking for, but if you Google words such as: gifts for adults with autism, you will get results that may be able to help you. Hope this helps!